NPEV's (non-polio enteroviruses) - of which there are literally dozens - typically flourish in the summer and early fall, and generally produce mild or asymptomatic infections, mostly in children under the age of 10. Symptomatic cases can range from a mild fever or a runny nose - to HFMD (Hand Foot Mouth Disease) - a generally mild childhood disease characterized by blisters on the hand, feet, and mouth. In North America HFMD is usually caused by the Coxsackie A16 virus, or less commonly, the Coxsackie A10 virus. In recent years, we’ve also seen the emergence of the Coxsackie A6 virus (see MMWR: Coxsackievirus A6 Notes From The Field) which has been associated with more severe illness. But for several decades - particularly in Asian and Western Pacific nations - we've monitored yearly NPEV epidemics of a much more serious nature, with the most severe illness linked to Human Enterovirus 71 (EV-71). Two summers ago, North America (and to a lesser extent Europe) saw a highly unusual outbreak of a rarely reported EV-D68 virus - causing thousands of mild illnesses interspersed with scores of cases of polio-like paralysis (see Eurosurveillance: Acute Flaccid Paralysis Following EV-D68 Infection – France). Severe outbreaks of NPEVs - while still rare in North America and Europe - return each year in Asia, and there is little reason to believe similar outbreaks couldn't someday migrate to Europe or the Americas. 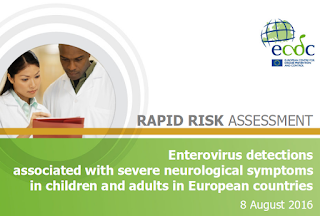 Today, in response to a recent reports indicating an increase in patients presenting with severe acute neurological symptoms across several European nations - probably associated with enterovirus infection - the ECDC is back with a new Rapid Risk Assessment. Since April 2016, Denmark, France, the Netherlands, Spain, Sweden and United Kingdom (Wales) have reported severe enterovirus infections associated with a variety of different strains. Compared with previous years, the Netherlands and Germany also reported increased detection of enterovirus-D68 and other enteroviruses. In addition, Ireland reported an increasing number in enterovirus-associated viral meningitis cases. The timing of the current epidemics closely follows the usual increase in summer, but reports suggest that seasonal enterovirus (EV) activity in the EU/EEA Member States started earlier than in previous years. Some Member States also report an increased frequency of severe disease associated with EV infection. While it is difficult to interpret these observations in the absence of robust historical data, Member States should consider raising awareness of the importance of including EV infection in the differential diagnosis of neurological and severe respiratory illness in order to identify cases and initiate appropriate precautions, as well as to provide more robust epidemiological information. Reporting of enterovirus clusters and outbreaks through the Early Warning and Response System (EWRS) in EU/EEA countries is encouraged. The full molecular and biological characterisation of the isolates from the current outbreaks will possibly enhance the understanding of the pattern of enterovirus epidemiology in Europe, including trends in subgenotypes associated with more severe clinical disease and molecular epidemiological links to strains between countries and from outside Europe. Increased numbers of EV-A71 and EV-D68 detections reinforce the need for vigilance for enterovirus infections, especially cases that present with more severe clinical syndromes. Clinicians should be encouraged to obtain stool and respiratory specimens for enterovirus detection and characterisation from all patients presenting with symptoms suggestive of meningitis; encephalitis; hand, foot and mouth disease(HFMD); acute flaccid myelitis (AFM) or acute flaccid paralysis (AFP). Since April 2016, several EU/EEA countries have reported severe enterovirus infections. Some countries reported an increased numbers of enterovirus detections compared to previous years. It is likely that there is ongoing widespread transmission of different enterovirus species and serotypes in Europe, including EV-A71 and EV-D68, with the majority of detected and reported cases representing the more severe clinical disease. Before 2016, infections caused by EV-A71 have only occasionally been associated with severe outcomes in Europe, which makes the current situation in Europe unusual. With August and September often being the peak season for enterovirus infections, this is something we'll keep an eye on. For now, control and prevention are limited to promoting good hygiene, and removing children with signs of the disease from child care or school environments.